Anyhow, the reality is that different organizations have different needs. Therefore, you sometimes end up with more or less complex OU structures. In order to make the creation of the ‘more complex structures’ as the one in the screenshot below easier, I’ve created a small function that lets you copy the structure from a template or from an existing, already properly configured site/structure. The script copies an OU structure from one OU to another. The destination OU must already be created. Plain name of the source OU to copy the structure from. Plain name of the destination OU to replicate the structure to. The script are provided “AS IS” with no guarantees, no warranties, and they confer no rights. Write-Verbose "Copying structure from $SourcePath to $DestinationPath..."
Write-Warning "Error with creating OU=$Name,$DestPath`r`n$_"
Running the example as below, will copy the entire structure from OU=JKG to OU=BRU. It will not overwrite any existing OU’s. As you can see above, the entire structure has now been copied according to the Source OU. Let me know if you have feedback or suggestions on improvements! 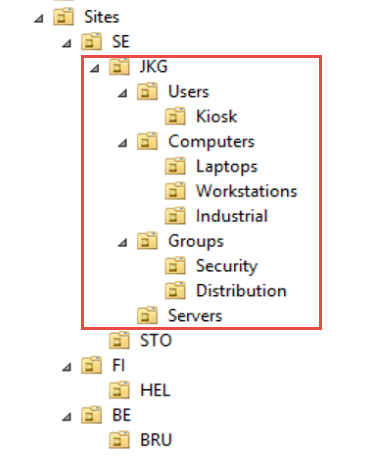 This entry was posted in Active Directory and tagged Copy OU Structure, Copy OU Structure AD PowerShell, Replicate OU Structure Powershell on November 28, 2014 by Johan Dahlbom.